Now that spring is here it is time to perform some essential home maintenance tasks that you weren’t able to do all winter. Having clean gutters is important for the health of your home. Gutters and downspouts clogged with leaves, pine needles, or debris can cause damage by allowing moisture into the roof and under the shingles. The water will eventually rot the wood and fascia boards that the gutters are attached to. Clean gutters and downspouts move water away from the foundation and house. Water that pools around the home’s foundation can cause cracking and deterioration of the slab or footings. If you live in a high fire danger area, loose leaves in the gutter can ignite and catch on fire from flying embers. There are many benefits to maintaining clean gutters and downspouts, but it is essential to know how to do it safely. Sometimes a gutter can be cleaned from the ground with a garden hose and a special hose attachment. The attachments are wands that have a U-shaped bend at the end. The end piece curves around to sit in the gutter. When you turn the water there is enough force at the right angle to wash away the debris and leave you with clean gutters without having to climb a ladder or get on the roof. 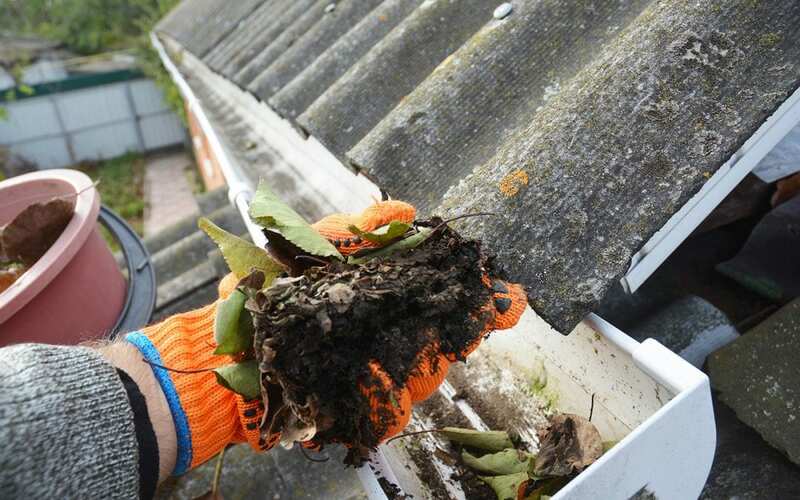 Often gutters can become packed tightly with leaves, so you may have to climb a ladder to clean them properly. Items you will need to clean from a ladder are a small handheld gardening shovel or a gutter scoop, a trash can or bucket, a garden hose with a nozzle sprayer, and a tall ladder. Gutter scoops are specifically designed to fit and scrape out gutters. Most hardware stores sell the cleaning gadget. Inspect the area for any powerlines before you put the ladder up. Stay clear of any electrical wiring, and make sure you have a long enough ladder. Position the ladder so that it is secure against the home and solidly on the ground. Climb up to the roof and dig out the clumps. If they are stuck in place, try blasting and soaking them with water and letting them sit for a few minutes. The water will loosen the dirt and make it easier to pry loose. Scoop out the debris. When you get a scoopful, throw it into the bucket or trash can on the ground, or if your ladder has a hook, hook the small bucket to it. This will save you from having to pick up the trash again. Don’t forget to rinse water through all of the downspouts. If they are clogged, and the clot will not break free, it may be easiest to remove the downspout and work on it from the yard. From the ground, you can force water in from the bottom. Once you have removed any blockages, spray out any remaining debris. With the final rinse of your clean gutters, check for leaks and repair or replace the leaking sections. Having clean gutters is essential in home maintenance, but homeowners should always perform the task with safety in mind. AAA Home Inspections serves Central and Northern New Jersey with inspection services for home buyers, home sellers, and homeowners. If you need a licensed and certified home inspector, we welcome you to contact us to schedule an appointment.